You were a good friend of Harrison's. From his many books of prose, poetry and essays, what would you consider your favorite book? I’ve read just about all of his books, I believe. I think some of his best fiction is found in his collections of novellas, which is a very difficult form. But the books that I return to often are his poems: After Ikkyu; The Shape of the Journey; and Braided Creek, which he wrote with Ted Kooser. I reread essays from The Raw and the Cooked because they’re a stitch. Nobody moves from a consideration of tomatoes to philosophy to to wine to birds to chicken thighs…with such alacrity. It’s a little known fact that Jim Harrison invented the alternative fact. What can you tell us about the author himself? For years Jim came to Marquette in the spring and fall. My wife Patricia (friends called her Reesha) and I thought of these visits as a sign of the change of the seasons. He’d stay at the Landmark Inn, a few blocks from our house. Years ago he had a dog named Rose, who would stay with us at our house. Sometimes we’d go out to dinner; sometimes he’d come to the house and he and Reesha would cook together, which was like watching a ballet (my job was to keep opening the wine bottles). Conversation with him changed the way you read his work. His mind worked in different directions constantly. He’d start to talk about a recipe for salmon or whitefish (which we often cooked at the house), and it would turn to a description of how to slow-simmer tomatoes in garlic and basil, and then to bird-hunting in Michigan’s Leelanau Peninsula (where he and his wife Linda lived for decades before moving out west), and then to a line from Lorca (who was one of his favorite poets), and then to an encounter with a black bear outside his cabin in Grand Marais. I think he was plagued by memory, by recollection. He didn’t want to let anything go. It was a torment and he loved it. In Michigan, you are a celebrated author, Wolf's Mouth a Michigan Notable Book, go back thirty years or so when you were younger, of course, and tell us your big moment of WOW, I am a writer. And how did that take place? I really don’t recall a “big moment of WOW.” Actually, I think that to this day I begin the day by asking myself “Am I a writer?” The day I stop asking that question is the day I have moved on to something else. I can think of few things more difficult to define. What is a writer? I try to find out every day. I think writers are people who should try to invent the wheel every damned day. As an historical fiction writer, name some of your favorite historical fiction writers and their books. Ragtime, by E. L. Doctorow. I first read it the summer of 1975, when I was in my mid-twenties. I taught it often because it pulled my undergrads out of their perception of what a novel should be, and because of how it dealt with class and race and immigration in America. I come from what I’ll call American immigrant stock, being a blend of Irish Catholic on my mother’s side, and English and Russian Jewish on my father’s side. This novel, set in the first years of the 20th century addresses so many things that divide us as a people, while also examining what binds us together. The Girl with the Pearl Earring, by Tracy Chevalier. Set in Delft, Holland, in the 17th century, the narrator is an adolescent girl who works as a maid in the home of the painter Johannes Vermeer. I taught this in my Good Books class often because the girl, Greet, who has no formal education, is so honest and perceptive. Her situation in the Vermeer household reveals a great deal about patriarchal privilege, but also about art. Many of my students had never visited a museum or an art gallery; had never had the experience of standing before an original work of art. (I’d often take them to the current exhibit at NMU’s art gallery.) Though the novel is of course a fictional rendering of how Vermeer came to paint The Girl with the Pearl Earring, the story speaks to how imagination and possibility can lead to a work of art, and how art can lift one to a place that has little or nothing to do with one’s own experience. 1984, by George Orwell. I taught this novel in 2004. The book was published in 1948 and, when I first read it decades ago, it was considered “futuristic”; not exactly sci-fi, but an attempt to explore the political and social possibilities of the future. But when my students read it (many of them having been born in or around 1984), they thought of it as being an historical novel—about a distant past. It’s one of the few books I know of that, though it is so connected to a specific time, the year 1984, it has proven timeless. Some of my students loved the book; many of them hated it. It’s not a book that elicits a mild response. I read the other day that since Donald Trump’s election there’s been a significant spike in the sales of 1984. I’ve also taught Margaret Atwood’s The Handmaid’s Tale, which seems to speak to aspects of our current situation and, like 1984, manages to blur notions of past and future. Interestingly, both these novels have suddenly returned to the bestseller lists. The publisher of 1984 has announced that they’re going to issue 75,000 copies of a special edition. Remember, the clock is striking thirteen and 2+2=5. In The Schoolmaster's Daughter, you write of "human behavior gone awry," which is Harrison's blurb for your book. Do you observe human behavior gone awry as a writer immersed in experiences, whether in Boston, Marquette, or Detroit? I never think of human nature going awry more in one place than another. That being said, I love writing about place. I love describing weather, houses, landscapes. When I go to a museum or gallery, I’m often drawn to paintings that render such things. Some abstract work appeals to me, but I’m more likely to gaze a long time at a painting of a salt marsh or a storm gathering on the horizon. If human behavior didn’t go awry, we wouldn’t need to write novels, and that’s probably true for most works of art, whether it’s a blues song about lost love or a painting of a girl riding a bicycle in the rain. We don’t fit comfortably in the world—not often, anyway. We bump up against it, and against each other, and that’s what captures this novelist’s attention. I grew up on the outskirts of Boston and have lived in various neighborhoods of the city. When I walk around Boston, I can see its history as though looking down through layers of time. I know, for instance, that where my father worked on Canal Street (a block from Boston Garden, now called TD Garden, where the Bruins and the Celtics play) used to be what was called the Mill Pond. The Schoolmaster’s Daughter is based on the Lovell family, who lived in Boston during the Revolution. For decades John Lovell was the headmaster at the Latin School, which was right behind King’s Chapel, where the old city hall now stands, and across the street from the Omni Parker House Hotel, which is famous for its rolls and for inventing Boston Cream Pie. The Lovell family was divided: the parents were ardent Tories, while their children conducted espionage operations for the patriot cause. I wanted the book to examine the tension that must have been at the dinner table at teatime, or when they heard the rattle of drums as British soldiers marched on the Commons, a few blocks away. And I wanted readers to know how these young people had a very real influence on events during that first year of the Revolution, from Lexington and Concord to Bunker Hill. I think we use the word hero too often, too easily; but I think the young Lovells were genuine American heroes, true patriots. She’d leave the lists on my desk. I’m a great believer of the Post-It note. While writing books such as Schoolmaster, Quarantine, and The Anarchist I would have stacks of books around the house and in my office at school; some I’d bought but many I’d found in libraries. Some of those books would date back a century or more, and they would not have been checked out of the library in decades. They were like gold. Once several years ago I received a polite call from a staff member at the Peter White Public Library in Marquette, requesting that I remember to remove all the Post-It notes from books before returning them. Who is your favorite writer, living or dead? This is impossible to answer, really. I admire the work of so many writers, for different reasons. I remember when I was an undergrad at Boston College I read Carson McCullers and John Steinbeck, and believed they were both truly great writers (I still do). A couple of years ago I read Borges’s Ficciones, and felt the same way. When someone asks who my greatest influences are, I want to say “All of them.” But favorites, I guess that’s a different question. When I was in my early teens I read Poe, and then Salinger, and then Le Carré’s The Spy Who Came in from the Cold. In high school I read Hemingway and Another Country, by James Baldwin. But perhaps the most remarkable reading experience early on was the novels by Albert Camus, The Stranger, in particular; but also The Plague and The Fall. Let me conclude by mentioning what I’m reading at the moment, as I like to read a number of books at the same time, and I believe that while what one is reading doesn’t determine what you think, it often influences the way you think. Right now I’m reading: Evening, a novel by Susan Minot; Late Night Thoughts on Listening to Mahler’s Ninth Symphony, essays on science by Dr. Lewis Thomas; The Pigeon Tunnel, a memoir by John Le Carré; and Travels with Herodotus, by Ryzard Karpuścínski. I can’t honestly say I have a “favorite” writer. I prefer to think of myself as a sponge, absorbing some—certainly not all—of what I read into that place (call it the subconscious?) that replenishes a writer’s reservoir. What do you want to be known for as a writer in twenty years? That my work was honestly rendered, but I could have been funnier. A lot of what I read is older texts. As I said earlier, I’m often digging in the library stacks and finding books written and published generations ago. Sometimes when reading such a book I feel that it has been sitting there on the shelf gathering dust, waiting for me to come along. There have been moments while reading something written, say, 106 years ago that I will discover a passage that speaks to me as though it’s a voice whispered down through the years so that the thought, the language is as fresh and alive as the day it was composed. I believe that’s why that person, long dead, made the effort to write that book. That’s why I’m writing mine. A lot of talent came out of the University of Iowa's writing program. Can you say a few words about your experiences there? My two years at Iowa I lived in a storefront in a dilapidated brick building in Riverside, a farm town (pop. 823) 14 miles south of Iowa City. The building was in such condition that my landlord, Jim Kaufmann, who has since been a lifelong friend, didn’t ask for rent the second year I lived there, just that I help out with some carpentry and painting that the place desperately needed. I think I was the oldest member of my class at the time (aged 32 to 34). While in Iowa I wrote a good portion of the rough draft of what became my first published novel, Winter by Degrees, which is about two brothers, two out of work carpenters trying to survive a winter in Newburyport, Massachusetts. It’s common to bash writing programs, claiming that you can’t teach someone to write fiction or poetry. People who register such complaints need to find something to do. I never really thought that I was being “taught” anything at Iowa. I was there to sit in a room with other writers, and with more experienced writers who had established reputations. People such as James Alan McPherson (who died last year), Bharati Mukherjee (who just died a few days ago), and Doris Grumbach (who, thankfully, is still with us). They were wise and knowledgeable, and they often had things to say about our work, good and bad, that were worth hearing. So did many of my classmates. We read each other’s work and discussed it; we read novels and stories and discussed them. What was important to me was that I had two years during which I was focused on writing a novel (I’d tried several times before, but things had run aground for one reason or another). It was the first time I had lived for an extended period away from the Boston area (my father had died the year before I went to Iowa, and my mother lived on Cape Cod). I was unduly homesick much of the time. In Iowa, radio stations didn’t announce the day’s tides, as was the custom back home, but talked about something called pork futures. I had never heard of a pork future. I wouldn’t have gotten through those two years without my dog Toby, a Lab-Shepherd mutt. Occasionally, when I’m driving somewhere in the country and I see an Amish wagon on the side of the road, it’s like I’m back in Iowa. Jim Harrison's novel, Sun Dog, was a definitive reading moment for me, probably because that kind of story can only work in Hemingway country. What are your thoughts about a place like the Upper Peninsula as an influence on writers? When I drive I-75 north through Michigan’s Lower Peninsula, something happens to me as I pass the sign near Grayling which says that you’re crossing the 45-parallel and thus are halfway between the Equator and the North Pole. From there on north the land changes; for long stretches you see few houses or buildings, just woods and hills. When I cross the Bridge I often roll down the window—even on a cold winter’s day—and let out a shout. Most everyone I know in Marquette does something to celebrate crossing the Bridge. The Upper Peninsula and northern Michigan is a haven. I’m not a native but have lived there for several decades. Lake Superior, which I can see from my house in Marquette, is a fundamental presence in my life. My mother and first wife, who died ten and six years ago, respectively, are out there. During our short summers I sail the lake in a boat named for my mother; I walk its shores, and I listen to it every day—when the north and east wind is up it sounds like the waves are in my backyard. When I’m away from Marquette, I miss the lake, but there is something comforting and reassuring in knowing that it’s there. Had I not spent years in the U. P., I couldn’t possibly have written books such as Cold, Fire Point, and Wolf’s Mouth. 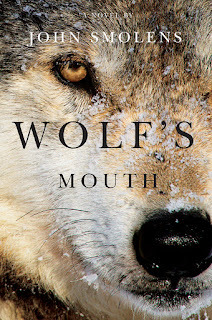 Wolf’s Mouth is a first person narrative, told by an Italian army officer, Francesco Giuseppe Verdi, who is captured in the north of Africa in 1943 and shipped to a POW camp in the U. P. Such camps really existed during World War II. The most frequent response to the novel is surprise—even shock—that there were POWs in the United States (there were over 425,000 in approximately 170 camps, nationwide). Francesco is in the camp in Au Train, which is perhaps 25 miles from Marquette. For me, the novel is largely about voice, the voice of a man whose native language isn’t English. He tells his story in plain English—I’ll call it acquired English. There are no Archie Bunkerisms here, not intentionally. He’s quite adept at languages and he learns English—and particularly American colloquialisms—as a means of survival. He escapes from the camps and remains in America after the war, becoming a model citizen: he’s a law abiding man who’s married and has a small business; he pays his taxes, even. He’s like us, but he’s never one of us. Francesco Verdi becomes Frank Green. At least 50 years pass, from the time he served in the army to when he’s an elderly man looking back on his life. The story moves from the U. P. to the Lower Peninsula (particularly Detroit), and then later he returns to the U. P. Francesco/Frank is haunted by his past, never quite comfortable with who he has become in order to survive. I suppose all novels are about life and death; or they’re about how one survives between the two extremes.